Join Nami in a Q&A session as she celebrates her 6 year blog anniversary answering questions from fans! 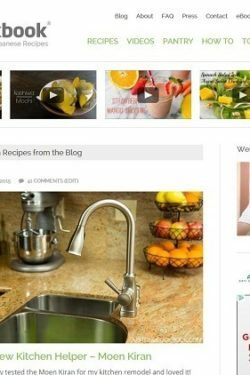 I was excited and driven to add my recipes to the site, as I didn’t have to collect paper recipe and cards for my recipes anymore. I finally had a place where I could store my recipes for my family. I feel really happy and honored whenever my readers tell me that they enjoyed my recipes. I am so glad and honored the readers have trust in my recipes and my taste. Everyone’s positive feedback keeps me going! It was less than one week. That’s what Mr. JOC just said but it’s been 5.5 years since we first tested Adsense so our memory is a bit foggy. It was Unagi Chazuke, published on January 3rd, 2011. It was after the Japanese New Year feast, so we were craving for something simple and light. I had only few readers when I started blogging, myself and my friends who were interested in my recipes. The most challenging part was learning about blogging, especially everything behind the scene. We didn’t know what platform to choose and which hosting company to go with. It took several trial and errors to get it correct over the course of several years. The rewards include meeting new blogger friends around the world and learning authentic recipes from them. My income mostly comes from advertisement on the blog and special corporate evangelist projects, and occasionally sponsorship. A lot of companies started to reach out to me when I have more readers and I always choose whom I want to work with. I wish! When I cook at home, I go to my own site and follow my own recipes to make sure they work every time. So I agree that a JOC app would be nice. Mr. JOC looked into this once, it’s easy to create an app. However, to build an app that’s easy to use, intuitive, beautiful, and how I envision it would take a lot of effort…so maybe not at this time. Anyone know good app developer they can refer to me?? I’m not hiring at the moment. However, it would be nice to hire a photo shooting/food styling assistant, and someone who could help me with my blog’s features and backend. Our time with the kids on weekends. We film almost every weekend, both Saturday and Sunday. Since we need natural light (daylight) for our photoshooting, a big chunk of weekends go into JOC production. Our kids are very supportive about it, but we always feel guilty about it. As soon as we finish working, we spend time together as family. Whether I blog or not, I mostly cook Japanese food at home and my family prefers to eat Japanese food. But I do cook non-Japanese food occasionally, like pasta, salad, soup, meat dish and so on. Very tough question! The best dish that “I” think, right? Hmm.. maybe not yet. 🙂 . My family’s favorite is probably Mapo Tofu. I have a lot… too many favorites. Each cuisine has some food that I really love, and they are equally my favorites and simply not comparable… Really. 😉 . I do have a weakness for pasta. The “first” Japanese food for my kids was rice porridge, then puree of a single ingredient, then combination of ingredients. Finally softer and bland version of our regular food. I used to scoop out small portion from our dinner BEFORE seasoning ours, and mash it or cook further to soften. For example, if Nikujaga was on our menu, I’d take out some portion before seasoning adult’s portion, cooked a bit longer and then seasoned lightly. If Miso Soup, I scooped the top layer of soup where there is not much salty miso taste. In Japan it’s common to “portion out” baby/toddler’s food from adult food instead of making ANOTHER dish just for the baby/kid. Sorry it’s not cuisine, but as a way to improve my blog, I really want to learn more about regional Japanese food. 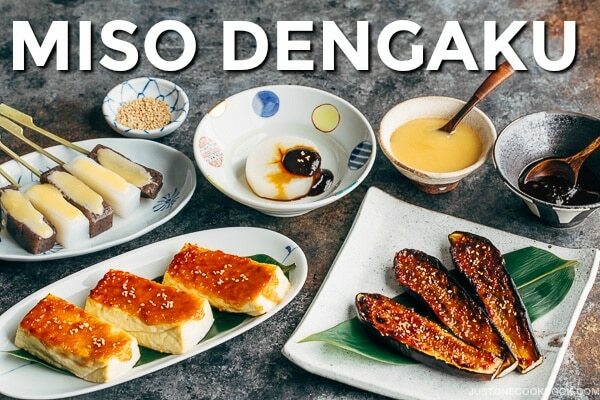 I received quite a lot of requests about regional foods in Japan, and I want to explore more so I can talk about it and share the recipes here on my blog. Yes, I do. I sometimes wish I don’t have to so that I can sleep a bit more. I looked forward to lunch time and my mom’s bento when I was in school. I hope to give the same feelings and experience for my children. For soups and salads, we use the type of seaweed called wakame. We do not use seaweed in casseroles. I have some salad recipes using wakame here: Cucumber & Wakame Salad (basic), Cucumber & Wakame Salad (with Sesame), Cucumber & Crab Salad, Octopus Salad, Salad with Japanese Dressing, and Tofu Salad. Chicken gizzard, Mr. JOC’s request. It was quite good after boiling for 40 min and seasoned simply with salt and pepper. I only tried one piece. LOL. I like cooking because I get to see my family’s smile when they eat my food and they really enjoy the food I make. I think that’s a strong drive in me. I cook so that my family can enjoy the food and the happy moments together. Thank you for your interest! I received same requests from other local readers too. Realistically, I don’t have the capacity. Blogging and making videos already take a huge chunk of my time, and I would like to keep my family time. For Monday through Friday, I mostly cook Japanese foods. For Saturday and Sunday, we usually have to eat out for lunch and dinner as we spend most of the day filming. My family’s top 5 favorite dishes are Hambagu, Japanese Curry, Tonkatsu, Korokke, and Miso Salmon. I want to go to France and Italy, and I’ve been saying that all my life. Hopefully one day… 🙂 I’m going to London this April and I’m so excited as it’s my first time in Europe! So hard to pick one! I just can’t… As I’ve never been to Europe, I’d be happy to be in one of European countries. I’m also interested in visiting Asian countries like Korea, Vietnam, Malaysia, Singapore…thinking all their delicious food I enjoy all the time. I’m visiting Thailand again to visit my brother this summer, so that’s exciting. I’m hoping to tag along with Mr. JOC when he goes on business trip to Chile and Australia. For our family’s dream trip, we want to go to Africa and enjoy the safari. Besides occasional banana bread and banana muffins, I don’t have time to make homemade snack anymore. It might be strange, but one of their favorite snack is Onigiri. My absolute favorite Taiwanese dish is all the breakfast dishes! The vegetable steamed buns, egg omelette, steamed dumplings, breakfast sandwiches, milk tea… When I’m in Taiwan, I go to sleep every night looking forward to breakfast. For Spanish dish, I love Jamon (influenced by Mr. JOC) and grilled octopus. Two types of “Japanese” breakfasts. Japanese style (Washoku) and Western style (Yoshoku). I just looked up which one is more popular in Japan, and it turned out it’s about same. The western one is slightly more popular as it’s easier to prepare in the morning. Typical Japanese style breakfast includes steamed rice, miso soup, grilled fish, tamagoyaki, small sides, pickles, natto, etc. I grew up eating western style breakfast everyday as that’s what my mom prepared. Her typical breakfast included delicious bread from bakeries (she’s fanatical about good bread), eggs, hams or sausages, yogurt, and a mountain of salad. I think it’s a Japanese thing to eat salad from breakfast (do westerners eat salad for breakfast?). When we’re in Taiwan, we visit Mr. JOC’s family members and go for a short trip (within Taiwan) with his mom. Day to day, we just hang out in shopping mall (because it’s too hot outside), take the kids to some sightseeing spots, and try out different foods. We always try to squeeze in a hot spring trip and Ding Tai Fung. My all-time favorite snacks for a road trip or Shinkansen ride: Toppo, Meiji’s Almond Chocolate, Chipster (salt), Bourbon Rumando… I can buy these snacks at my local Japanese grocery stores, but I try not to eat snacks (I’m already overweight…). 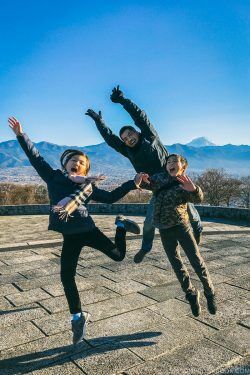 We visit Japan every summer and spend most of the kids’ summer break there with my family. When I was in teens and 20’s, it was all about chocolate. Ever since late 30’s, I’m really into citrusy desserts. I also love crusty or crispy dessert more than soft dessert. I always love Japanese sweets with red bean paste and matcha. I’m lactose intolerant (getting worse as I age) and developed allergic reactions to crab, mango (one incident), and occasionally tomato/eggplant (my tongue gets weird). We sometimes splurge and make wagyu steak at home. You can buy real wagyu from Japan (Miyazaki Beef) at Pape Meat or Debragga online. Mr. JOC does such an amazing job preparing the steak. But since you said “restaurant”… I remember the wagyu prepared at Keiko à Nob Hill was really unique, as it was served with citrus yuzu-soy foam. I believe Alexander’s and other steakhouse also sell real Wagyu, but it’s really overpriced compared to Japan. I just try to enjoy as much as I can when I am back home (same goes for sushi). But this is what I still practice – I try to listen to English more. When I’m cooking alone, I listen to podcast or news in English. I also watch movies and dramas to learn new phrases. I’m hoping that one day new words and phrases I learned come out naturally after hearing them so many times. I use real drinking sake (but they are less than $8-$10 for this big bottle). The mirin I currently use is Hon Mirin from Japan called Fukuraijun Hon Mirin (Hakusen Shuzo) (shown in the picture). It’s hard to find Hon Mirin, but I try to use it instead of mirin-like condiment. 🙂 If you cannot find it, it’s okay. But the taste might be slightly different as it has salt etc which Hon Mirin doesn’t have. Awesome post! Thank you for sharing this! I am glad you had the courage to post your video, and I think you should not be so shy about that because this was a really fun video to watch and I learned some new things that were great to know about you and your blog. I would enjoy watching another one in the future! Nice Q &A! I just had a question too-do you ever make Chinese food since your husband is from Taiwan? I am sure you both must like each other’s cuisines. You mostly cook Japanese it seems and he must like that. Perhaps you eat Chinese out since there are great Chinese places in your area. What is your favorite Chinese dish? Yeah we go to Chinese restaurant a lot when we get together with a big group (Chinese big round table is easy to accommodate several families) so we feel like we are always eating Chinese food. And this area has pretty good Chinese foods. Mr. JOC enjoys Japanese food and he even prefers to eat Japanese foods, so I don’t regularly make Chinese dishes at home. zuozi from malaysia i wonder is there any ramen soup base you will teach us ? I honestly think it’s not for a busy home cook. I can’t justify myself the time and effort spent for a few bowls of ramen broth. I rather want to spend more time creating easy ramen recipes that taste amazing. 😉 We’ll see! excellent Q&A! also very cute. I have questions: Will you show us your refrigerator next time? and how do you manage/ keep your ingredients? as a full time houseworker, I am struggling with these. Hi Annie! Thank you for watching my video! Oh yeah, I remember I said I’d do that when I did my kitchen tour. I’ve been trying to create evergreen content for my site, so this kind of content sort of pushed away… at least temporary. So you are curious to know how I organize in my fridge? Wow! That was great, thank you. Thanks so much for watching my video, Erin! Thank you for answering my question and for the plug! I loved watching your first Q&A session, more please! Thank you so much! I guess some vegetables that can be mixed into meals or easy to get ahold of. I think I would like to try snow peas, as my parents love green beans but the tying to eat the pod makes me feel sick. As a kid i would open the pod and eats the beans inside, but that is wasteful and just plain messy. I also see a lot of picked vegetables in asian cooking, and was wondering what they taste like, are they a vinegary flavor like american pickles or do they taste different? Oh and sorry for taking so long, my classes have been assigning big projects and I had’t time to check my email or your site until today. Hi Erin! I am not sure what type of texture and taste you’re trouble with, but snow peas and green beans have this fibrous texture and pretty strong taste, in my opinion. In another word, when you chew, it won’t go in quickly and you have to chew for a long time. I don’t know if you’re okay with that? Thank you for answering all of my questions! It may seem silly, but I felt special. You made my day! I’m glad you like natto. I will try your recipe. Hope you have a nice Sunday with your family????????????! 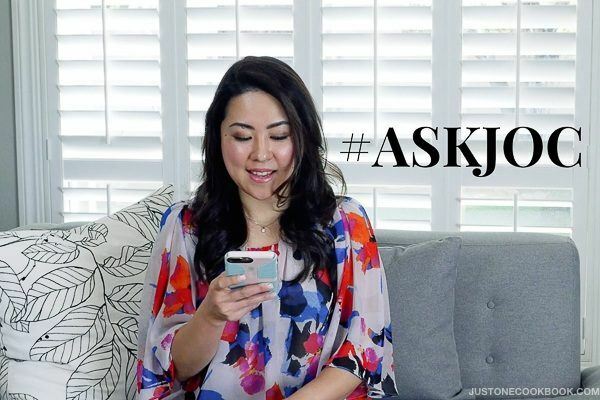 I think you and Mr. JOC did a fabulous job on the Q & A video! You have a lovely smile and personality! LOVE all your recipes and videos! Thanks so much for sharing your recipes ! You are so cute, Nami! 🙂 Loved hearing and reading through your responses – this was such a fun idea! Thank you for sending the questions, Laura! It was a big challenge for me to get out of my comfort zone. Some people are natural and talented in speaking comfortably and naturally, but me? I can’t even do it in Japanese… LOL. I enjoyed your Q & A. show. Not as easy to do as it looks good job. Some how in the Winter I have gotten away from your recipes. I do a lot of sous vide dishes. Time to go back. Dishes to eat when it’s snow & cold would be helpful. Meant to mention earlier, but I was impressed how you managed to keep posting and updating your blog even while you were on your ski trip. When I go, we ski the entire day and just want to eat and go to sleep and get ready for the next day of skiing. My question is are your recipes mostly tried and true, or are you creating & experimenting with new ones all the time? 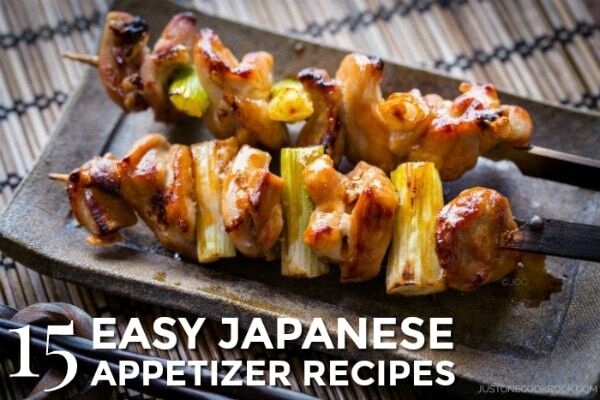 Do you happen to have recipe for shoyu pork and/or Thai basil chicken. Have made before, but wondering if you might have good recipe to try. Oh we also go to DTF in Arcadia too! We’re also pretty good at squeeze in good food between chores or plans! Fun video, and great Q & A. Thanks! Thank you John! I’m a bit (or should I say quite a lot?) embarrassed…. LOL. Hi Nami, The Q & A video was great! Thank you guys for making it. 🙂 I got really excited about the simple Natto Udon dish you shared. Quick question though…did you use actual umeboshi and just pop out the seed and dice it up or did you use some sort of umeboshi paste? Is there a particular brand/type of umeboshi you recommend? Thank you! I take out the seed with hand or knife (and pop in my mouth to eat around the seed cleanly while I make this dish – then throw away the seed. haha). I chop the umeboshi before putting into natto. I enjoyed yr video very much – you spoke so well!! Looking forward to seeing more recipes in yr blog!! Hi Debra! Thank you for your sweet words. I hope you enjoy my upcoming recipes! Nice to read this, time flies fast, I remember during the days roughly five or more years ago we started following each other. While I know some of this info due to your posts I still learn new things like tips and tricks from you. Love your blog and its such an inspiration to me. Thanks Nami, great q&a! I keep wanting to ask how you combine dinner. I mean, which dish goes well with another and how do I manage to eat enough vegetables? 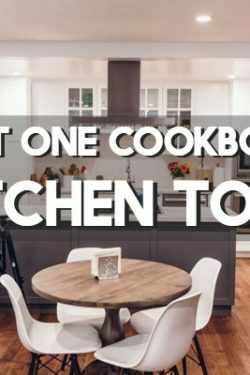 There are one-pot-dishes but many are just with one main ingredient, it takes a lot of time to prepare a whole meal, right? Hi Nami! I remember somewhere there was a post where you were asking for feedback and suggestions about your blog. I guess I can’t find it, but I thought of something today that I think could be helpful to you, so I wanted to leave a comment somewhere. It would be so helpful if your recipes could have a section at the top saying “wait time” or something like that, when a recipe requires a wait. I have had it happen a few times where I went to make a recipe and only saw the prep time and cook time at the top, then didn’t realize until I’m making the recipe that there is a long wait for something. For example your Negi Miso Chicken recipe has a 2-3 hour wait for the chicken to marinate. I didn’t realize this until I’m already preparing dinner, thinking the full recipe would only take 40 min to prepare. Oops. I try to read all the recipes fully before I start, but sometimes I miss details like that. Seeing that time included at the top of the recipe would help me out a lot, and hopefully other JOC readers! I’m definitely usually on a time budget to make recipes, trying to squeeze it in with the rest of life. I hope that someday this feature can be added to JOC! Hi Lion! Thank you for leaving your comment. I’m actually in the middle of transfering 600 recipes into a new recipe plugin. The old recipe plugin (Negi Miso Chicken hasn’t converted yet) didn’t allow this. I needed “Inactive” time section which includes marinade, freezing, rising… If prep time shows 2-3 hours, a lot of people will not bother to check the recipe. Therefore, several years ago I started to add the information in Note section (“Prep time does not include 2-3 hours of marinating time” etc), which was the only place I could write besides step by step area. This was one of the reasons I wanted to change to a recipe plugin. Now current recipe plugin doesn’t have “Inactive” time section, but we can manually change the total time. So prep time can be 15 minutes, cook time 15 minutes, but total time can be 2.5 hours, which previous recipe plugin didn’t allow me to do. So… hopefully you won’t encounter this issue anymore once all the recipes are converted. I’m 1/3 done…. long way to go…. very tedious conversion one recipe at a time……. Thanks again for your feedback, Lion! You’re the best! My husband and I will be going to Japan end of November and is wondering where can we get a map of the train/rail for Tokyo and Yokohama? Can you please help us? Hi Flo! Do you mean online map? Hope this doesn’t scare you… this is for a bigger area around Tokyo/Yokohama.